Walking football is a relatively new phenomena but there can be no doubt that since its inception in 2011 it has enjoyed a meteoric rise in popularity and gained a significant amount of coverage in the media, so much so that the governing body of football in the UK, the FA is now in the process of making it an officially recognised form of football. Clubs have sprung up all over the country and now number over 800 nationwide with national and many regional cup competitions and leagues being held annually. So what is the appeal of a sport that has lead to it growing so fast and especially in Lancashire ? Well obviously there are huge health benefits associated with regular exercise for the older generation but perhaps one of the biggest and less obvious appeals of the sport is that now there is a place that men and to a lesser extent women over 50 can now go to and get involved in a team sport they love but most importantly they can mix and socialise with people of a similar age with a common interest or to put it another way, they can 'make new friends and have a laugh' ! Perhaps in the words 'make new friends and have a laugh' lies the real appeal of walking football because whilst all the talk in the media is about 'lower heart rates and regular exercise' what many older people suffer just as much from is what's know as 'social exclusion' or in other words, not having many friends, people of a similar age that they can socialise with and interact with on a regular basis and share a laugh and some banter with. This is perhaps borne out in the fact that many players I have come across are in truth, never going to be Stanley Matthews but that is clearly irrelevant when their enthusiasm, the sweat on their brow and the smile on their face tells you they are loving every minute of it. Yeah, they may go home from a session with a few aches and pains but to them that is a small price to pay because in reality, and I have personally been told this on many occasions, many of these people have literally regained a purpose in life and now have something to genuinely look forward to each week which, for many older men is something that was lacking until they found walking football. Ok it's true that everybody has different reasons for being involved in walking football and more specifically in this case The Fleetwood Town Flyers, right from the relatively fit 51 year old who wants to play competitive walking football at the highest possible level to the 75 year old who just wants to remain active and we cater for all of them but what about the guy sat at home who may be carrying a long term injury or who loves football but feels that for whatever reason he is unable to come along to a session and actually play walking football ? The good news is that everybody who wants to become involved with the Fleetwood Town Flyers can do so and it doesn't have to be as a playing member ! Everybody had different skills and experience, especially later in life so people are encouraged to bring them to the club and make some new friends into the bargain. 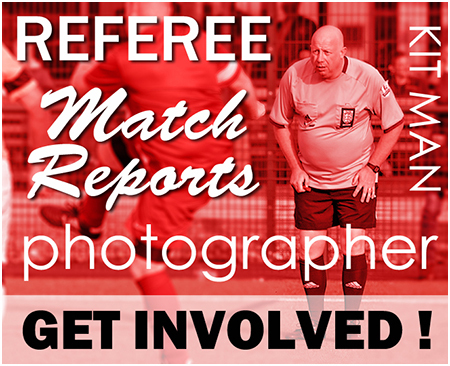 Perhaps there are people who have experience as a referee or feel they have the personality for the role, so could get involved by offering to referee at our sessions and maybe even the tournaments we host. Perhaps some may have a love of photography and would like to take pictures for the club website etc. maybe people have some admin or managerial skills or even just enjoy that kind of thing, well a club like ours is happy to find a role for competent people to help with the running of the club or to help run the likes of the Lancashire League Summer Series on match days etc. Truth is that a club like ours has a lot to offer and as the saying goes, the more you put in, the more you get out so whether you fancy writing match reports for us to use on the website or would just like to cheer the players on from the sidelines and enjoy a drink in the bar after a session or attend our occasional nights out and social events there is a way to be a part of the Fleetwood Flyers. If you feel that you would like to become involved in the club in some way other than playing walking football then get in touch or just pop along to one of our sessions and we can guarantee that you will receive a very warm and friendly welcome.